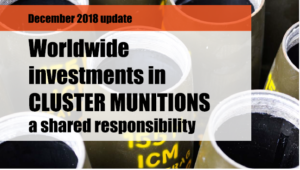 More and more financial institutions have acknowledged that cluster munitions producers are not ethical or viable long-term business partners and have installed a public policy to end investments in these companies. We list good examples of financial institutions with such policies in the Hall of Fame and Runners-Up. Financial institutions are listed in the Hall of Fame when they have installed and implemented a comprehensive policy banning all financial links with cluster munitions producers. Some financial institutions have installed a policy on cluster munitions that shows certain shortcomings. These financial institutions are listed in the Runners-Up category. We commend the financial institutions in the Runners-Up category for their efforts while at the same time suggest ways to strengthen their policy. To identify financial institutions with a policy on cluster munitions, PAX and research company Profundo analysed a variety of sources: NGO reports, screening-agency information, financial institutions’ reports and websites, information from campaigners worldwide and other public sources. Since the banking group usually sets the investment policy and since this group directly or indirectly supervises its subsidiaries, we researched the group’s policy. We contacted all financial institutions in this list prior to publication to verify our research findings and to be sure we interpreted their policies correctly. Financial institutions that did not respond to our questions on their published policies were not included in this chapter. We only include policies publicly available at the time of writing. It must be transparent and accountable on its cluster munitions policy. This means that the investor has published its policy and/or a summary of it. Its policy must exclude investment in cluster munitions producers (recalling past investment and avoiding further investment). We contacted all the financial institutions in this list prior to publication to verify our research findings and to be sure we understood their policy correctly. Importantly, a financial institution can be applauded in the Runners-Up category for its policy, while at the same time being listed in the Hall of Shame for its investment. If that is the case, we note this explicitly.